The Colwell Thundering Herd Ranch was established in 1984 when Rich and Nancy Colwell returned to their childhood community and purchased property from Rich’s parents, Stan and Dorothy Colwell. Stan and Dorothy Colwell moved to Penryn in 1959 with their six children. The family home was built in the late 1800s and the land supported peach, pear, and plum orchards. 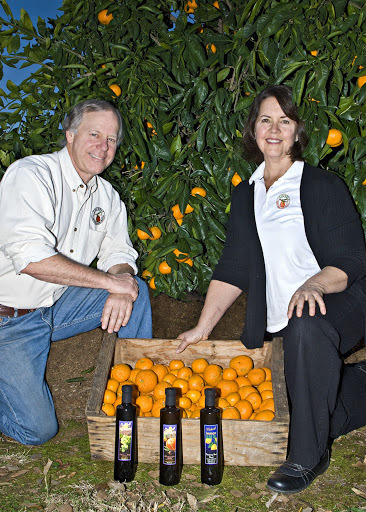 Nancy and Rich Colwell display bottles of their award winning 2012 Mandarin Crush olive oil, Lemon Crush olive oil, and balsamic vinegar. Colwell products have sold out in each of the six years since the family farm began offering its products for sale. Rich and Nancy and their five children – Katinka, Michael, Suzy, Nancy, and Kristin- worked together over the past 34 years to clear their section of the property and hand planted a grove of sweet, seedless Owari Satsuma mandarin trees. Over the years, the Colwell family “planting for the future,” added Meyer lemon, Hachiya and Fuyu persimmons, orange, lime, kumquat, pomegranate, apple, and plum trees to the grove. The hillside ranch enjoys a southern exposure with warm days and cool nights, providing the perfect climate for growing citrus fruit. With great pride, the Colwell family hand picks and packs the tree ripened fruit to ensure the highest quality and flavor for our customers. Over the years, as both our trees and our children have matured, our fruit production has increased. Looking for innovative approaches to blending the exquisite mandarin and lemon flavors with other food products so that they can be enjoyed year-round, the family began working with olive growers and oil producers from Corning, California. In 2007, mandarin and lemon crushed olive oils were milled and made available to the public. The mandarin and lemon olive oils and the imported balsamic vinegar which compliments them, have sold very well and have been recognized with numerous awards including "BEST OF SHOW", BEST OF DIVISION", and "BEST OF CLASS", as well as "GOLD", "SILVER", and "BRONZE" medals in large, international and local olive oil tasting competitions. Colwell oils and balsamic vinegars have sold out by the end of December each year. 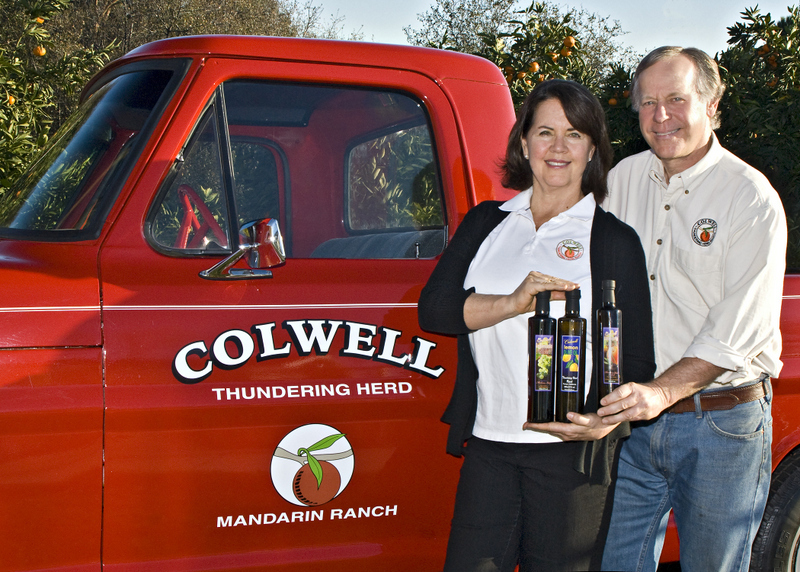 Nancy and Rich Colwell, owners of the Thundering Herd Ranch, showcase fresh mandarins handpicked from their orchard along with bottles of their 2012 award winning Mandarin Crush and Lemon Crush olive oils milled from their citrus fruit and their traditional balsamic vinegar aged 18 years imported from Italy. Two years ago the Thundering Herd Ranch introduced a new line of chocolate desert sauces including Orange Chocolate Liqueur Sauce and Cabernet Wine Chocolate Sauce. These gourmet sauces, developed by a noted Napa Valley chocolate company, have been taste tested and richly enjoyed by Colwell Thundering Herd Ranch customers. The chocolate sauces have been very well received and sold out each year in mid-December. The Thundering Herd Ranch is very much a traditional, small family orchard. Our children, who many years ago assisted with clearing the land and planting the trees, now assist with the irrigation, hand picking, and hand packing of the fruit. They also provide marketing and website development guidance. When we sell our citrus crushed oils, chocolate sauces and fresh fruit at the various festivals and local markets in the area, our children (after which the “Thundering Herd Ranch” is appropriately named) are often in attendance selling our products and demonstrating the pride they carry for the quality of the sweet, healthy fruit and the other related products which their labor has produced over the years. Most importantly, our children started raising the next generation of Thundering Herd Ranch hands – Drew, Caden, Jackson and Emmett, Eli, Jamison and Natalie – who are already helping Grandpa Rich and Grandma Nancy cultivate the trees in our grove. Our family is our strength and we invite you to share in the bounty of our shared affection and labor.